What is it about Sears Stuff? Oh no, now there are CARS too? Hi, my name is John Pfingstag and this is my website dedicated to things sold by Sears & Studebaker. Whether it's Allstate motorcycles, Allstate cars, Silvertone radios or ???? that you could buy from a Sears Roebuck and Co. catalog, I am probably interested in it. I grew up in a small town (Wickenburg, AZ) and life was often reflected in the 1,600+ pages of a Sears Big Book. When the Fall/Winter version came, it was a day to celebrate (sounds like Steve Martin: "The new phone books are here!") and revel in whatever might be new on all those wonderful pages. As you peruse these pages, let your mind wander back to a simpler time, when mega-malls didn't exist, and getting something special delivered by your friendly postman was one of life's little pleasures. A former project, completed, then sold. 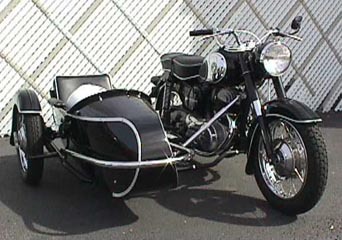 1966 Puch SGS250 with Globe sidecar. Built from piles of parts. VERY fun to ride. 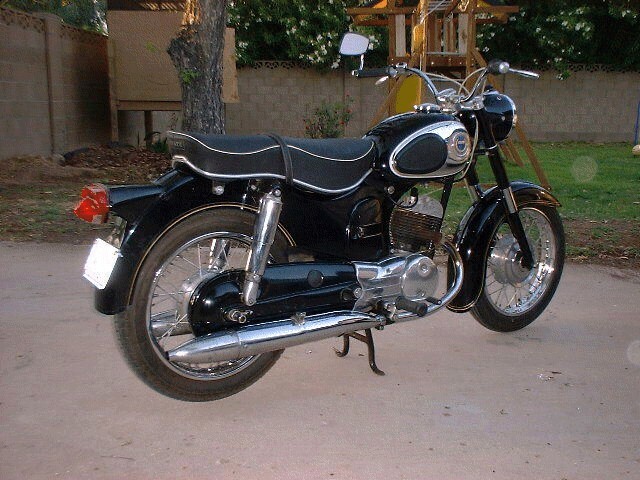 This is a wonderful low mileage 1966 SR175. Built by Puch, sold by Sears, owned by me. What could be better?